When the marital estate includes a closely held business, a business ownership interest, debt or equity securities, or intangible assets, the family law counsel (“counsel”) may retain a valuation analyst (“analyst”) who specializes in the valuation of such financial assets. The counsel may retain such a valuation specialist when the marital estate ownership interest includes shares in a family-owned or otherwise closely held company, partnership interests in a professional practice, a professional license, or family-owned intellectual property rights. This discussion summarizes some of the issues that counsel may consider in the selection of such a valuation specialist. In addition, this discussion summarizes the development procedures and the reporting procedures with regard to such a family-law-related business or intangible asset valuation. Counsel should be generally familiar with the professional standards and practices for the valuation development and the valuation reporting related to such marital estate financial assets. This is because, in addition to retaining the analyst, the counsel will have to work with, rely upon, examine, and defend the selected analyst— and the analyst’s valuation expert report. And, in a deposition or at trial, the counsel may have to cross-examine an opposing analyst—and respond to the opposing analyst’s valuation expert report. Calculation Engagement versus Valuation Engagement in a Family Law Context— Can a Valuation Engagement be More Efficient and Effective? Within a family law context, legal counsel (“counsel”) to each marital estate party may retain a valuation analyst (“analyst”) to assist with certain equitable property settlement aspects associated with the marital dissolution. Namely, the analyst may be retained to estimate the value of certain marital property, such as a family-owned business ownership interest. In such instances, counsel may retain the analyst to perform either (1) a calculation engagement or (2) a valuation engagement. This discussion (1) highlights the differences between a calculation engagement and a valuation engagement within a family law context and (2) explains when each engagement may be most appropriate, efficient, and effective. This discussion also includes a summary of certain business valuation professional standards and practices associated with each type of engagement. Business valuation in a family law setting requires a broad understanding and reasonable application of generally accepted business valuation theory and practice. This discussion identifies 13 questions that a testifying expert should expect to hear, and opposing legal counsel (“counsel”) should consider asking, in a deposition/cross-examination. The questions typically are relevant with regard to any business valuation performed in a family law context. Responses to the questions can provide significant information (1) regarding the foundation for an opposing expert’s valuation analysis and opinion, and any weaknesses that can be exploited, and (2) that can be used to support the valuation variables underlying the valuation analysis and opinion of counsel’s own expert. In a family law context, the valuation analyst (“analyst”) may be retained by legal counsel to review the valuation of a business, business ownership interest, or security prepared by another analyst. The review of another analyst’s business valuation report requires an understanding of generally accepted business valuation practices, including an understanding of relevant business valuation standards and procedures. This discussion addresses the applicable professional standards that analysts consider when completing a review of a business valuation report and provides analyst guidance with regard to some of the more common inconsistencies or errors identified during a review engagement. In family law matters, the valuation analyst (“analyst”) may be retained to provide an independent estimate of the value of closely held service-oriented company ownership interests, or professional practice ownership interests, to assist in the equitable settlement of the marital estate. During these assignments, one common issue that analysts and legal counsel confront is the identification and treatment of any goodwill included in the value of the closely held service-oriented company or professional practice. In general, this goodwill can be identified as either (1) enterprise (or institutional) goodwill or (2) personal goodwill. This discussion summarizes the differences between enterprise goodwill and personal goodwill. This discussion addresses state statute guidance with regard to the treatment of enterprise goodwill and personal goodwill within a family law context. This discussion also summarizes (and provides an illustrative example) of the generally accepted valuation approaches, methods, and procedures that can be applied in the analysis of goodwill within a family law context. The valuation of either business (also called institutional) goodwill or personal (also called professional) goodwill is a common issue in the family law context. The goodwill issue arises when the marital estate owns a private company or a professional practice or when one of the marital parties holds a professional license. The goodwill valuation may affect the value of the private company or professional practice ownership interest. The goodwill valuation may be relevant if the practitioner’s personal goodwill either is—or is not—a marital estate asset. And, the goodwill valuation may be relevant if the marital estate includes only the appreciation (or the excess over a normal amount of appreciation) in the goodwill during the term of the marriage. This discussion summarizes many of the analyst’s considerations in the valuation of goodwill in a family law context. Valuation analysts (“analysts”) are often called on to value intellectual property for family law purposes. This is because a marital estate may own, directly or indirectly (through a family-owned or private company or professional practice), intellectual property. In such instances, the value of the intellectual property can be the subject of considerable controversy between the marital parties. For this reason, family law legal counsel—and other parties involved in the marital dissolution process—should (1) understand the procedures and factors commonly used to identify intellectual property assets, (2) recognize the generally accepted approaches to use to value intellectual property assets, and (3) be familiar with the intellectual property economic attributes that analysts consider when valuing intellectual property assets for family law purposes. In a family law context, legal counsel (“counsel”) may retain a valuation analyst (“analyst”) to estimate the value of a closely held business ownership interest held within the marital estate. When estimating the value of this marital estate business interest, the analyst may apply the income approach, discounted cash flow (“DCF”) method. When applying the income approach, the consideration of the subject company industry is an important issue for the analyst. This is because the analyst should apply due diligence procedures when utilizing management-prepared financial projections in the analysis, including the comparison of the management-prepared financial projections to relevant industry data. Further, company management interviews may assist the analyst in performing appropriate diligence procedures with regard to the application of the income approach (including the application of management-prepared financial projections). This discussion summarizes the relationship between the income approach and the subject industry. And, this discussion provides practical guidance regarding the analyst’s role in (1) properly addressing the subject industry when applying the income approach and (2) conducting company management interviews in a family-law-related business valuation. 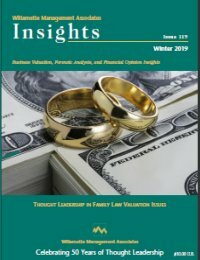 Family Law Valuation Practices and Procedures Thought Leadership When retained by family law counsel (“counsel”) to estimate the value of a private company within a marital estate, the valuation analyst (“analyst”) may consider the potential subject company dependence on one or two key individuals. This “dependence” is typically referred to as key person dependence or “key person risk.” Key person risk is recognized within the valuation profession as a relevant company-specific risk characteristic, and it can be accounted for in several ways within a valuation analysis. Therefore, the analyst may perform appropriate due diligence to (1) identify any key person risk associated with the private company and (2) quantify and present the impact of any key person risk within the private company analysis.